Almost everyone will suffer with back pain at some point in their life and research shows that it is one of the most common reasons for taking time off work. Between 50-80% of people will suffer recurring episodes within 1-5 years. Chiropractic treatment has been shown to be effective in the management of low back pain and is included in the National Institute for Clinical Excellence NICE (2009) Guidelines for the treatment of persistent low back pain. There are many causes of back pain and often it is a combination of factors that result in back pain rather than one single cause. Your chiropractor will ask you questions about your daily activities and your past history as well as conducting a thorough physical examination in order to identify the cause of the problem. Treatment offered to you by your chiropractor will be a specifically tailored package of care for you and your back pain with the aim of normalising your joint function. This can be achieved using a variety of treatment methods including manipulation or mobilisation, home exercises if necessary and advice. Examination and treatment are usually done on the same day, saving you time and less clinic visits. This effective treatment method is generally painless although you may feel some short term discomfort if your back is already sore. If improvements aren’t seen then further investigations can be arranged (for example X-Ray and MRI) or referral to your GP or a consultant. Latest national guidelines on back pain suggest that you should try to remain active, take gentle exercise as prolonged bed rest or inactivity may slow your recovery. At Well Adjusted Health the New Patient Initial Consultation is an hour-long appointment. During this time your case history will be discussed along with an Orthopaedic, Neurological and Chiropractic examination. You will also receive a detailed explanation of findings and exactly what can be done to address your symptoms. All this for 50% off the Initial Consultation, which is usually £50, during our Spring Special Offer. 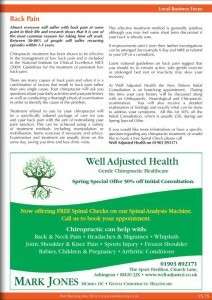 This entry was posted in In The Press and tagged back pain, chiropractic, low back pain, nice. Bookmark the permalink.